Dr. Thomas received an MPH in Health Education in 2001 from the University of Southern Mississippi. She then entered an MD/PhD program at the Louisiana State University Health Sciences Center in New Orleans. She received her PhD from the Department of Microbiology, Immunology, and Parasitology in 2009 and her MD in 2011. Subsequently, she pursued a combined clinical and anatomic pathology residency, and a clinical fellowship in molecular genetic pathology in the Department of Pathology, Microbiology, and Immunology at Vanderbilt University Medical Center. 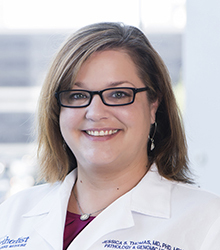 At the completion of her fellowship, she joined the Department of Pathology and Genomic Medicine at Houston Methodist Hospital Houston Methodist as Associate Director of the Molecular Pathology Diagnostic Laboratory. Dr. Thomas is currently an Assistant Professor of Clinical Pathology and Laboratory Medicine with appointments at Weill Cornell Medical College, New York, NY and the Institute for Academic Medicine at Houston Methodist Hospital. Dr. Thomas was licensed by the Texas Medical Board in August 2016, and has been a Diplomate of the American Board of Pathology in Clinical Pathology since November 2015. She is also board certified by the American Board of Pathology and the American Board of Medical Genetics and Genomics in Molecular Genetic Pathology (September 2016). Dr. Thomas is actively involved in several professional societies including the Association for Molecular Pathology, the American Medical Association, the Texas Society for Pathologists, and the Academy of Clinical Laboratory Physicians and Scientists. She is also a fellow of the American Society for Clinical Pathology and a fellow with the College of American Pathologists (CAP). Her clinical, teaching, and research interests are focused on molecular diagnostics, including molecular oncology and molecular infectious diseases, assay development and validation in the clinical laboratory, and trainee education in molecular pathology.